Parkin’s Yard is a quiet little cul-de-sac with a single row of terraced cottages just off Alfreton Road. The first one of these cottages used to have a lean-to Stockingers shop at the end. Two sisters by the name of Cutler both worked the stockingers frame. Fig.1 This map dated from 1881 shows the location of Parkin's Yard. The entrance being opposite C.N. Wright's Butchers on Alfreton Road. William Shiptons map of 1792 shows Parkins Yard containing some dwelling, however these appear to have been demolished in the mid 1800s as an auction in August 1858 describes the sale of 6 newly erected dwelling houses in nearly a finished state.These houses may be completed at an estimated outlay of £50. Parkin’s Yard gets its name from the Parkin Family, who lived at the 'Hollies' (No. 34 Alfreton Road). Fig.2 This picture shows a typical stockinger making ladies silk stockings or cotton hose. The work could often be done by women and children and as a consequence the wages were very low. Every hour of daylight was used to try and earn enough money to feed the family and pay the rent, not only for their house, but also the Knitting frames, which were usually rented from local Hosiers. A survey in 1844 showed that there were 137 knitting frames in Codnor and a further 57 in Loscoe. On average each frame would provide a living for three people. 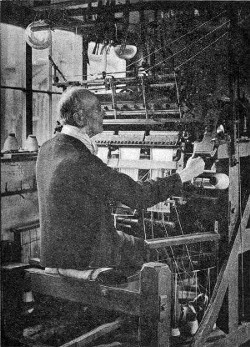 The introduction of steam powered knitting machines in factories such as I & R Morley’s at Heanor built in 1866, put an end to this type of cottage industry. "Right of Way at Codnor"
The right of way agitation in Codnor has again been opened through Mr F.C.Corfield, J.P., placing a fresh barrier on the path leading from Parkin’s Yard to Codnor Castle in the shape of a very strong structure, consisting of four steel rails fastened together by rivets an inch in diameter, the whole weighing at least four tons, and requiring eight or ten men a whole day to fix up. This proceeding as excited the indignation of the Codnor People. The other evening an attempt was made to pull down the structure, a crowd of people having collected and using chisels, sledge hammers etc., for the purpose. They, however only partially succeeded, and were not interfered with, although the work was done in a public manner and close to the residence of the owner. A second attempt, has however been made, and has proved quiet successful, all the structure being smashed down. The question appears to be, is there a public footpath in this direction or not? The offenders are known and may be prosecuted. The question now being asked is are the Codnor people fighting Mr Corfield or the Butterley Company.